Please be very familiar with these rules and check with this site for updates each season. Montrose Beach Rules: Memorial Day weekend to Labor Day weekend marks the season when the Chicago beaches are open to swimmers. 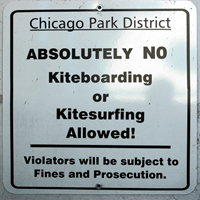 It is mandatory that any kitesurfer wishing to ride at Montrose be aware of the rules agreed upon by the Chicago Park District. Montrose gets extremely crowded during the summer and you must have level 2 certification from PASA or level 3 IKO. Launching and Riding: You must have a PASA/IKO Level 2 certification, or equivalent, to kitesurf at Monrose Beach. You must present this card at the lifeguard station for allowance to kiteboard for the day. Kiteboarding allowed when bathing areas are closed to swimmers due to high wave conditions. Beach then transitions to a shared use for windsports and kayaking. 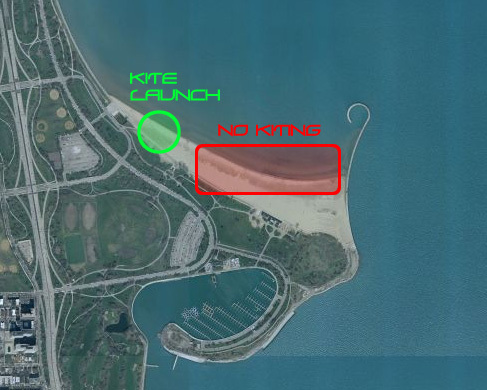 Only PASA Level II (or similar IKO) kitesurfers may ride Montrose Beach. You must have a city-issued kite streamer attached to your kite. Safety Equipment must be used including an attached Kite Safety Leash. 100 foot minimum Safety Zone from kite. Remain clear of people, piers etc. Kiteboarding allowed upwind the swimming area only. No teaching, no beach flying practice of big kites (4m or larger), no body dragging in the water. You may approach the guards to ask if you could go in the water to kite when there are swimmers, but they reserve the right to say “no” and you must ask first. A. You must have an issued kite streamer attached to your kite when riding. No streamer? No riding. (Gold Streamer: Kite Beach Moderator, Blue Streamer: IKO or PASA but not insured, Red Streamer: IKO or PASA and insured). There will be 5 guest streamers at the lifeguard house. Daily visitors leave their card at the lifeguard house and pick up a streamer. Drop off the streamer to get your card back. B. Rigging will be at the Dog Beach side (the West-most beach area at Wilson Ave.) This area has better parking, a grass rigging area, walk to your car. No more conflict with the Sailboats, Kayaks, or Vollyball Nets at the Bird Fence side. Note, this area has more pedestrian traffic than we are used to, please launch and immediately enter the water and ride upwind. Also respect the dogs. They are supposed to be leashed while outside their fenced area. Do not launch or enter the fenced area. C. Check-In / Check-Out will be required at the Lifeguard Shack. When you finish kiteboarding, you must retrieve your card. D. Out of town visitors must abide by these rules of access when riding at Montrose. In addition, please get a briefing from a local kiter. E. E-Coli Days. For now, kiting is stopped on these days. We are working on allowance to kiteboard when e-coli levels are high, since we are not actually swimming in the water. F. Rogue Kiteboarders will not be tolerated by the City. Do not kiteboard or fly large kites at other beaches. You can expect the other CPD (Chicago Police Dept.) to write you a ticket if you are kiteboarding anyplace other than Montrose. G. It will be the kiteboarder’s responsibility to be aware of the Lifeguards signaling them to return to shore and land. If you push the limits and try to stay out, we all run the risk of losing our priviledges at Montrose Beach. H. Do not ride inside the swim areas! Do not approach the swim areas! This means any near-shore riding (within 200 feet of shore), you must stay to the West and North of the lifeguard stands and come immediately to shore and down the kite when landing! Landing: When landing at the kite-rigging area, walk your kite on to the beach. Do not ride all the way up to the beach! Emergencies: If you experience a problem, or need to come ashore outside of the kite-rigging area (such as near the birdfence), down/land your kite properly and wrap up your lines immediately, prior to encountering swimmers or sunbathers, if possible. Walk your kite back to the rigging area after your gear is all wrapped up. Do not fly your kite while on the beach around sunbathers. Do not walk your kite across the beach while in the air!